The world is fighting a war with drugs. Illicit drug use is one of the most serious problems that is faced today. It has been prevailing world-wide and is gathering a lot of concern. Illicit drugs are those drugs which have been deemed illegal to consume. Illicit or illegal drugs can be highly addictive and can cause serious health problems. Drugs have a relation with the increase in crime. Drug use has been always a important issue that the world is dealing with. Addiction is a chronic disease. It causes a user to become hooked on the mental and physical effects of a drug. This report will focus on the illicit drug issues that prevail in Australia over a time period of 10 years. It will also focus on the various factors related to the use of illicit drugs. Figure 1 shows the percentage of illicit drug users who are aged 14 or older in Australia over the time period of 1995-2013. 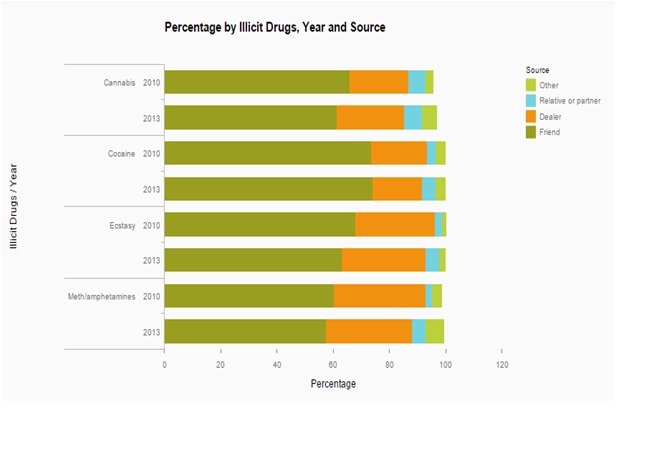 It shows that the percentage of people taking illicit drugs is increasing on an yearly basis. This is very alarming as more people are becoming addicted to drugs. In 1998, 46% of the Australian population was doing drugs. The percentage decreases in 2007 but then it gradually increased over the next few years. This shows that more and more people in Australia are using illicit drugs and the issue is not being controlled. 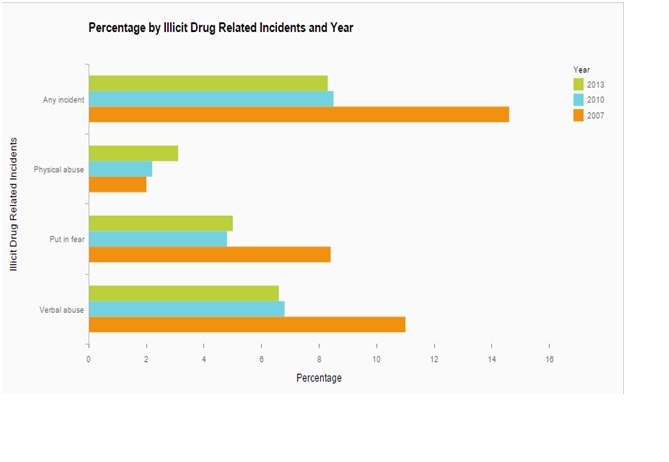 Figure 2 depicts the percentages of different types of illicit drugs with respect to years 2007, 2010 and 2013. There drugs are GHR, Hallucinogens, Heroin; Inhalants, Injected drugs, Ketamine, Marijuana/Cannabis and Psychoactive substance. It is clearly evident shows that marijuana/cannabis which is used by 35% of Australians is the most used drug in all the years. This is due to the fact that is cheap and easily accessible .Hallucinogens are also popular among the Australians. The least popular drug is Psychoactive Substances which became known in 2013 and stands at only 0.40%. Other drugs like GHB, Heroin, inhalants, ketamine are moderately used. This shows that most of the people in Australia opt for marijuana. 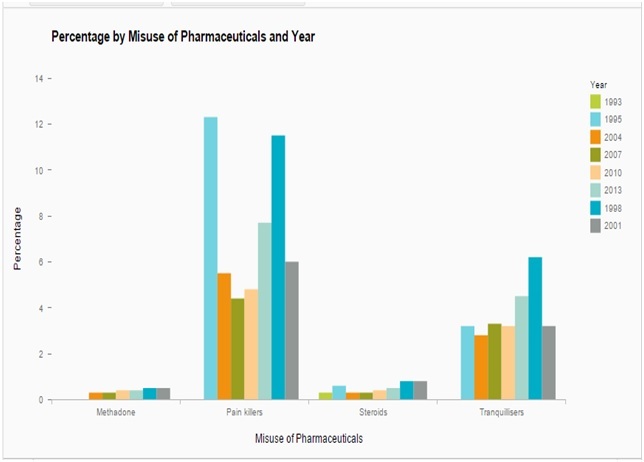 Figure 3 shows the percentage of people in Australia that misuse pharmaceuticals with respect to various years. Pharmaceuticals drugs (such as pain-killers and tranquillizers) when used for non-medical purposes, and other substances used inappropriately (such as inhalants) are called illicit drugs. It is very evident that in all the years, pain killers were misused the most by Australians. In 1995, 12.30% of people were abusing pain killers. Another drug that is misused by Australians is tranquilizers. Steroids and methadone are misused less comparatively to pain killers and tranquilizers. 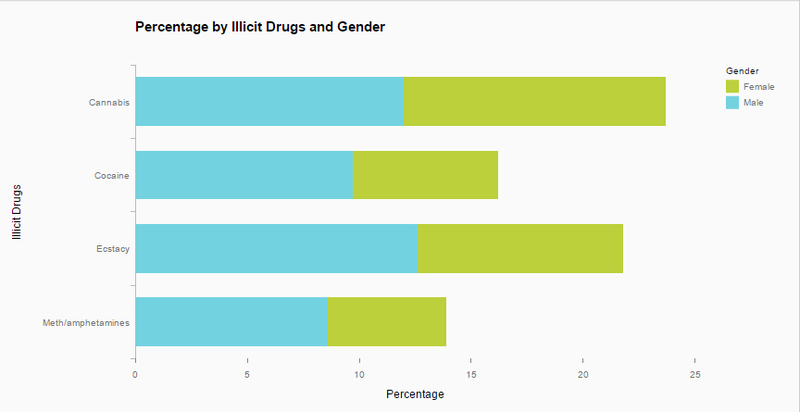 Figure 4 depicts the percentage of drugs by males and females for various kind of illicit drugs. It is evident that males and females smoke cannabis the most with both males and females standing at 12%. 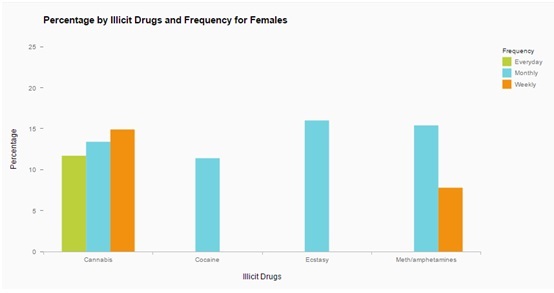 9.70% of males and 6.50% of females do cocaine. 12.60% of males and 9.50% of females do ecstasy. It is clear that males abuse drugs more than females do. This is because Males are more likely than females to have an opportunity to use drugs. However, there is no male-female difference with respect to trying a drug once an opportunity has been used. 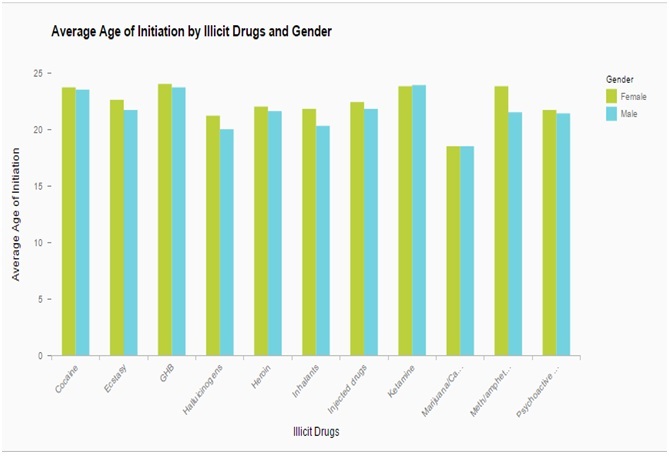 Figure 5 shows the average age of initiation of Australians into illicit drugs by gender. The research is done on the various kinds of drugs. It can be seen that the average age of initiation for marijuana is 18 for both males and females. It is also clear that for most of the drugs, the average age of initiation lies between 20 to 25. For GHB, the average age of initiation is around 24 years old for both males and females. This shows marijuana is popular and easily accessible for younger people, and they are willing to try marijuana very early in their life. 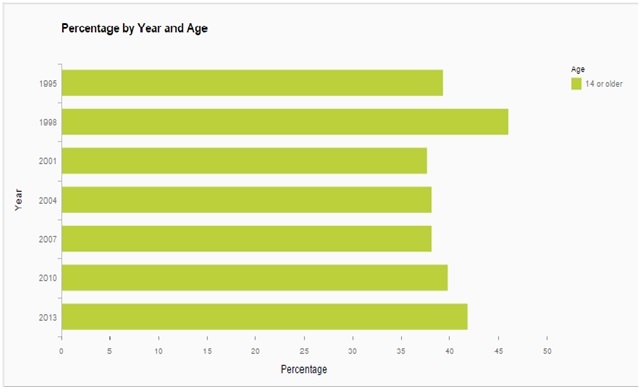 It also shows that GBH is tried by users at a very late age compared to other drugs. 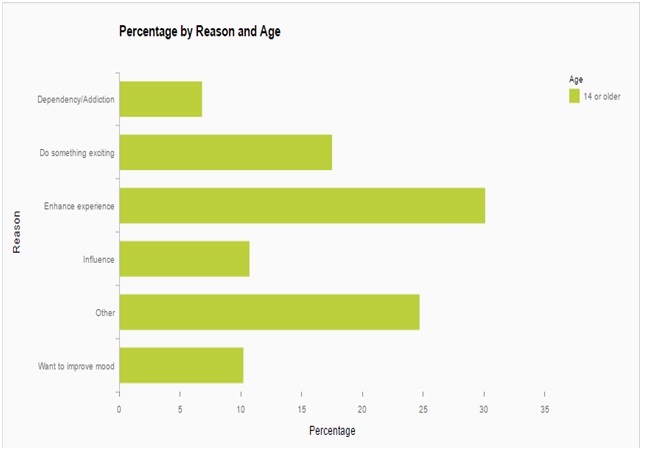 Figure 6 illustrates the report based on percentage of illicit drug users and the various reasons they use it for. Majority of the people in Australia use the drugs for enhancing their experience. Other main reason for drug abuse is to do something exciting in their life. Around 31% of people do drugs to enhance their experience. 10% of Australians use drugs to lift their mood. Dependency on drugs is also a cause for the continuation of drug use. Overall, the result illustrates that illicit drug users are using drugs because they reach a high level of excitement and satisfaction. There are many reasons for consuming the drugs and this poses a threat to the society. 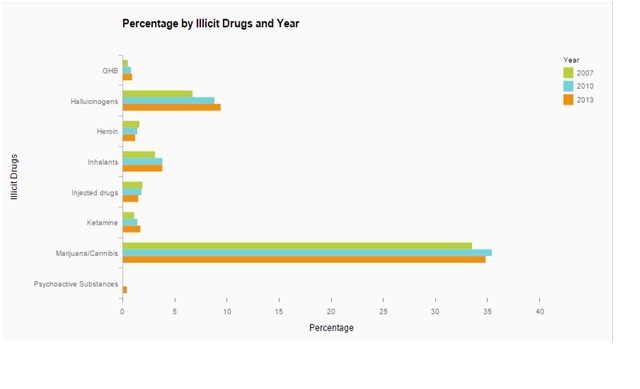 Figure 7 illustrates the various sources of illicit drugs by years and percentage. It is obvious that majority of the illicit drugs are obtained from friends. It can be seen that 73% of supply of cocaine is through friends. On an average, 60% of sources of drugs are through friends. The next main source of drugs is dealers. On an average,25% of people get their drugs from their dealers. So, friends and drug dealers are the main supply of drugs. The main reason behind this is that friends are affected by the peer pressure and they generally give in and fall into the labyrinth of drug addiction. Other sources include family, relatives and partner but they are less common than friends and dealers. figure that drugs play a very crucial part in alarming rate of criminal activities. 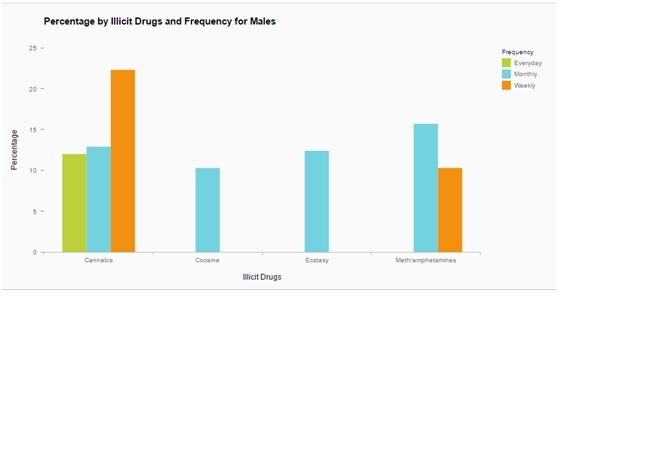 Figure 9 and 10 below show the frequency of using illicit drugs for males and females respectively in Australia. It can be seen that 12% of drug users do cannabis everyday, 13% do it once in a month and 23% of users do it once in a week. Cocaine is usually done once in a month by 11% of drug addicts. Ecstasy is also done once in a month by 14% of males. Meth is done on weekly and monthly basis by males. On the other hand,11% of females do cannabis everyday, 13% do it once in a month and 15% do it once in a week. Cocaine and ecstasy are done once in month and meth is usually done on a weekly and monthly basis. It is clear that males and females do drugs mostly on a weekly basis..
Use of illicit drugs is increasing at an alarming rate. It is also affecting the quality of life. It has a lot of disadvantages as it poses a threat to the community as well as the drug user. Drug use should be monitored very closely. A lot of people fall into the labyrinth of drug addiction and cannot get out. It has a lot of side effects and disadvantages. Hence, more strict laws should be implied for the drugs consumption.